On 28th February Jon Hilton the President of the IMechE, was in Huddersfield visiting Cummins Turbo Technologies, Huddersfield University and Kirklees College. 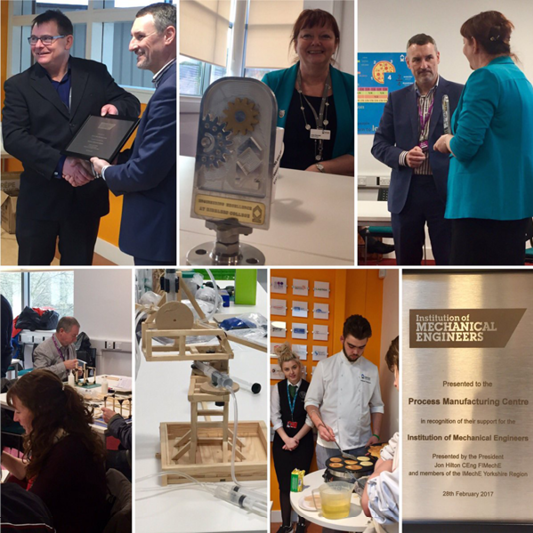 A highlight of Jon’s visit was spending time with a group of teachers who were engaged in the Secondary Engineer, Fluid Power Challenge training taking place at the College. This programme, which is supported by the IMechE, gives teachers the confidence and skills to deliver simple hydraulic projects to their pupils employing basic engineering principles and concepts, using readily available materials. Susan Scurlock, Chief Executive of Primary Engineer and Regional Director Kevin Burke guided Jon through the session, and Susan took the opportunity to brief Jon on the Institution of Primary Engineers, and present him with a certificate of honorary membership. Jon was certainly impressed by what he saw and the very positive feedback he received from the participating school staff. He agreed that this was a unique programme, and a vital contribution to the school engineering curriculum, that he wholeheartedly supported.